With winter in full swing, it’s a beautiful time of year to visit our luxury Bed and Breakfast in New Hampshire’s White Mountains. Whether you’re looking to take in the scenic winter wonderland, or whether you’d rather curl up in front of the fire place and enjoy some time alone, our Inn is the perfect place to escape. Our boutique Inn has been impeccably restored, and offers a charming, cozy, and sophisticated getaway destination. With all the amenities and luxury of a full-service bed and breakfast Inn, you’ll want for nothing during your time in New Hampshire. Though it may not feel like it, spring isn’t too far away. 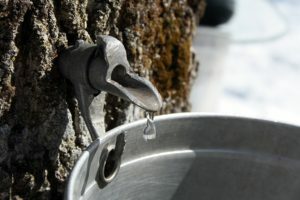 As we transition away from winter, it will soon be maple sugaring season in New Hampshire. If you’d like to learn more about this intriguing process, now’s the time to plan. Book a room at our New Hampshire Bed and Breakfast today.